on hot days, what’s really better than a refreshing, vegetable based meal? slightly chilled and light. or if it can’t be a popsicle (because we probably shouldn’t be eating ice cream all day long, sighs), make it a chilled soup, instead! without a doubt, i am a big fan of chilled soups… so far, i’ve only made the classic tomato based gazpacho though, be it with yellow or with red tomatoes. oh, and not to forget this cold soup here in green (gwyneth would be proud *makesfistsign*). but this new addition here, a cheeky pineapple and cucumber number with hot (pun intended) jalapeno is marvellous! i’m planning on making it this (long!) weekend. you can make it once and store in the fridge for a couple of days. not saying it will be left that long, duh. add the liquid – i.e. 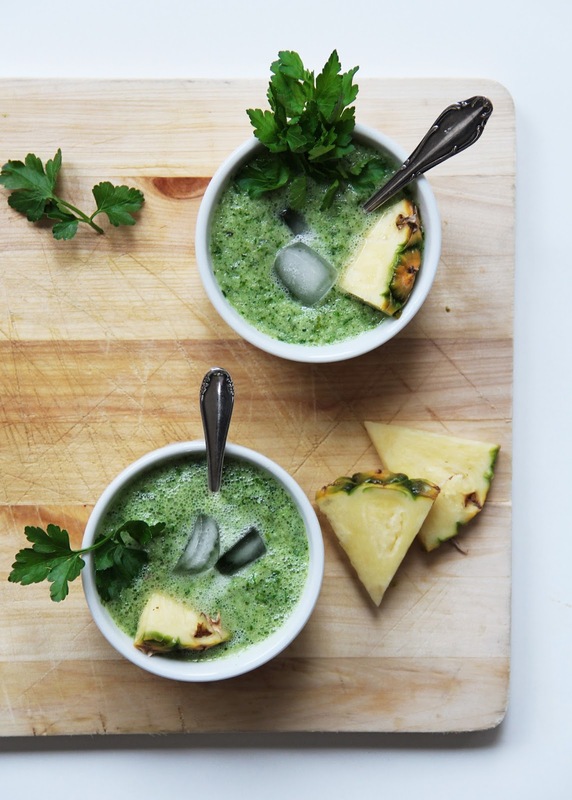 pineapple juice, lime juice as well as the broth – to the mixer. add the pineapple, cucumber, onion, garlic, jalapeno and parsley and pulse until very well blended. add the olive oil and season with salt, pepper and chili flakes. refrigerate for at least one hour. fill into bowls and garnish with ice cubes and herbs.